It had been thought that all nuts and bolts of the pony truck had been freed to allow its dismantling but not so: the Saturday Gang had done a good job cleaning the truck and thereby revealed four more nuts and bolts each side. 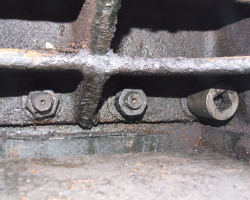 The bolt heads are countersunk so not easily seen, while the nuts, complete with split pins, are well hidden within the casting. All are now free to allow dismantling to proceed. 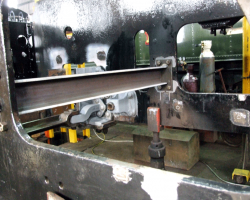 Further forward, work on the cross stretcher supporting the pony truck pivot carries on: the new upper section is in place, but wear in the pivot casting was found, so this has been removed for refurbishing. All stretchers attaching to the area have to be removed, a process involving drilling and burning out the rivets. This shows some ground flat. Drilled through and others completely removed. 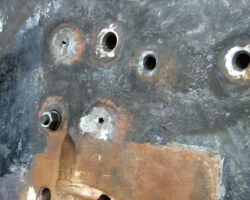 Bolts and nuts have been inserted in some holes to support the structure until this task is complete. 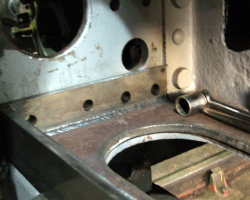 Looking through the right hand horn gap and showing braces fitted either side of the section to be removed, to ensure no movement or misalignment of the assembly as the new section is welded in.